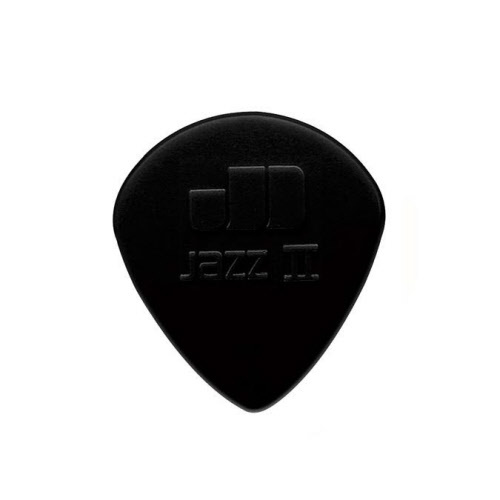 De Dunlop Jazz picks are loved by guitar players all over the world. Especially guitarists who like to enhance their technique are fond of the Dunlop Jazz I, II en III. Real guitar heroes as Eric Johnson, John Petrucci, Alexi Laiho and Joe Bonamassa rely on the Dunlop Jazz III for many years because it's fast release, firm format and sharp edge. Dunlop Jazz picks are available in rounded and sharp point. With the sizes of 1,10 mm, 1,18 mm en 1,38 mm. Color is black or red. Dunlop Jazz I picks. Material: nylon. Size: 1.10 mm. Color: red. Shape: rounded point. Now on sale: 24 pieces from € 16,95 for only € 13,95. Dunlop Jazz I picks. Material: stiffo nylon. Size: 1.10 mm. Color: black. Shape: rounded point. Now on sale: 24 pieces from € 16,95 for only € 13,95. Dunlop Jazz II picks. Material: nylon. Size: 1,18 mm. Color: red. Shape: sharp point. Now on sale: 24 pieces from € 16,95 for only € 13,95. Dunlop Jazz II picks. Material: stiffo nylon. Size: 1.18 mm. Color: black. Shape: sharp point. Now on sale: 24 pieces from € 16,95 for only € 13,95. Dunlop Jazz III picks. Material: nylon. Size: 1.38 mm. Color: red. Shape: sharp point. Now on sale: 24 pieces from € 16,95 for only € 13,95. Dunlop Jazz III picks. Material: stiffo nylon. Size: 1.38 mm. Color: black. Shape: sharp point. Now on sale: 24 pieces from € 16,95 for only € 13,95.